Thanks to the reporting of multiple sources including Variety and The Hollywood Reporter, Fox has all four cast members ready to go for the 'Fantastic Four' reboot. 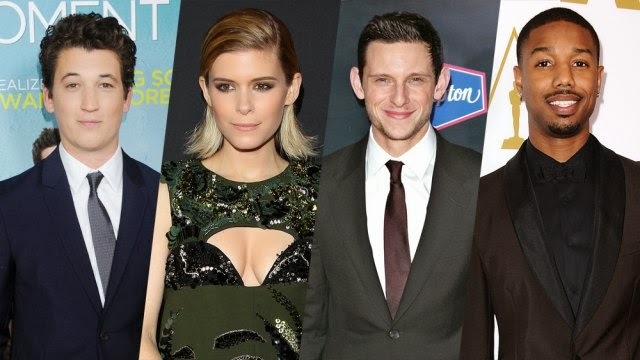 According to THR's sources, "...the studio (Fox) is making deals with Miles Teller, Kate Mara, Michael B. Jordan and Jamie Bell to star in the project that reboots the Marvel superheroes. Josh Trank is directing." After a long casting process, Teller will be playing Mr. Fantastic/Reed Richards, Mara will be the Invisible Woman/Sue Storm, Jordan is the Human Torch/Johnny Storm and Bell will be the Thing/Ben Grimm. From THR, "'Fantastic Four' was the very first comic produced by the Marvel Comics’ 1960s golden age and featured a brilliant scientist, his pilot best friend, his girlfriend and her brother who are turned into heroes Mr. Fantastic, The Thing, Invisible Girl and the Human Torch. They fought aliens and monsters but their arch-foe was Dr. Doom, a onetime roommate of the scientist." The comic was created by Stan Lee and Jack Kirby. The film has a re-scheduled release date for June 19, 2015 and we predict this young cast will become household names.